SyPen's 2 in 1 Ballpoint & Stylus Pens are a versatile, trendy, stylish & multi-functional tool that will serve multiple purposes for home, school or the office! SyPen's 2 in 1 Ballpoint & Stylus Pen glides smoothly across smartphone and tablet screens, which protects the screen from scratching or fingerprints, promoting the longevity of your devices. The two in one ballpoint and stylus pen design gives you more bang for your buck, as it is truly multi-functional and will take you from home, to the classroom or office, and back again. You can use this pen for everything from jotting notes into a notebook to doodling on your tablet. Choose from many different color variations to switch things up according to your mood and environment. The lightweight material and comfortable rubber grip make this pen the perfect choice for students, artists, avid notetakers, and anyone who writes for extended periods of time as it won't tire you out and molds to the contours of your hand. The highly sensitive tip provides great detail and accuracy and will enhance your experience with note taking, sketching, drawing, and photo apps. SyPen's 2 in 1 Ballpoint & Stylus Pens are compatible with a multitude of different devices and can be used with your smartphone,tablet, or paper. Our stylus/ballpoint pens provide all-in-one convenience with sleek sophistication & style that is sure to make an impression. MULTIPLE USES: Our stylus tip pens have an interchangeable tip so that you can use it on paper, tablets, & phones. Click back & forth between a stylus and ballpoint tip for your convenience. 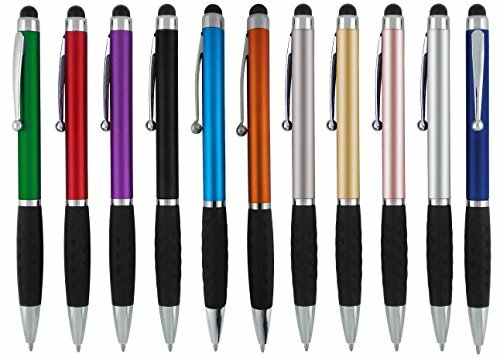 MANY DIFFERENT COLOR OPTIONS: Our stylus tip pens feature a sleek, sophisticated & streamlined design in many different color variations to accommodate your personal taste and whatever mood you're in. COMFORTABLE GRIP: Our stylus tip pens are made of a lightweight material and feature a rubber grip that contours to your hand for added comfort, making it the perfect choice for avid note takers. SENSITIVE TIP: Our stylus pen is highly sensitive & smooth, providing a seamless, pen-like writing experience. The fine tip allows you to achieve greater detail in your note taking & art projects. COMPATIBLE WITH MANY DEVICES: SyPen's Stylus Tip Pen is compatible with touch screen devices from various brands for your convenience. Use them everywhere from your phone to your tablet with ease. If you have any questions about this product by SyPen, contact us by completing and submitting the form below. If you are looking for a specif part number, please include it with your message. Premium Samsung SGH-A207 SmartPhone Stylus Custom Pen 3 Pack!